Systems can use several strategies to combat burnout in a supportive, interactive way. A rapid-response team can be a useful tool in identifying those at risk of burning out. ABSTRACT: Physician wellness and burnout are critical aspects of the current climate of optimizing provider health. About half of all physicians show some sign of burnout in their practice: exhaustion, depersonalization, loss of personal accomplishment. Systems can use several strategies to combat it in a supportive and interactive way. And a rapid-response team can be a useful tool in identifying professionals at risk of burning out as well as expedient solutions. “Physician, heal thyself” is a tall order, sometimes. Every day, physicians are tasked with a number of mandates, whether they are self-imposed or imposed by those to whom we must answer. Perhaps the CEO and the department head have asked physicians to participate in a Lean process designed to improve throughput in the emergency department. There is a directive to improve waiting room times, decrease door-to-doctor times, and decrease the length of stay in the department. Or perhaps an office manager has asked to meet with you to discuss your lack of improvement on maintaining your schedule and the number of patients per hour you must see to maintain your satisfaction scores. Or maybe the director of nursing wants to discuss adherence to the early goal-directed therapy for sepsis in the hospital. Metrics indicate that the nursing staff is having a difficult time with its compliance to the mandated goals because physicians are not entering orders in the electronic medical record in a timely fashion. By shifting our approach to burnout from one of reaction to one of prevention, burnout can be reduced significantly or averted altogether. When institutions or medical groups develop a proactive curriculum for approaching this problem, with an aggressive focus on prevention, burnout levels can be reduced. Exhaustion is feelings of emotional depletion, fatigue at work and frustration, and perhaps finding it hard to care how your patients feel. As we become depersonalized, we become detached from our work. Sympathy and empathy are lost, and patients are seen as an entity and their problems are now a source of frustration to us. Personal accomplishment is lost as we no longer feel we’re rewarded for our hard work and passion. Personal interactions with other caregivers can suffer over time. A provider is no longer as productive as in the past. The ability to multitask becomes strained, and physicians suffer cognitively. Healing thyself, therefore, requires not only the self-awareness of possible illness or burnout, but the motivation to do something about it. This self-awareness can be crucial to an individual’s self-diagnosis. West, et al., have designed a simple self-assessment for burnout.3 Using a six-point evaluation system, a score can be established that will point the provider to an approximate degree of burnout and dissatisfaction. The biggest obstacle to success with such a system is getting the survey into the hands of the physicians. Physicians are well-motivated to help their patients, but they often lack the insight and inspiration to recognize their own shortcomings. Physicians in specialties at the front line of care — emergency, internal and family medicine — are at the greatest risk of suffering from burnout.4 It can be assumed that a natural extension of either internal medicine or family medicine would include hospitalists, as they are also under the same system constraints. A Lancet article by Wallace, et al., includes discussion of a missing metric that we might be failing to capture.5 It’s not patient satisfaction or post-operative infection or readmission rate, but simply physician wellness. Physicians are trained to think by protocols and algorithms. An algorithm as designed by Wallace can allow the physician leader follow and understand all the subtle, yet tangible, forces that can align to work against physicians on their paths to wellness (see chart). By shifting our approach to burnout from one of reaction to one of prevention, burnout can be reduced significantly or averted altogether. When institutions or medical groups develop a proactive curriculum for approaching this problem, with an aggressive focus on prevention, burnout levels can be reduced.7 By planning or inviting physicians to participate in a physician wellness small-group curriculum, providers can effectively battle burnout. The academic community long has recognized that physicians in training are at great risk for malignant disease.7 In a 2000-14 study, 324 individuals (220 men, 104 women) died while in residency. The leading cause of death was neoplastic disease, followed by suicide. For male residents, the leading cause of death was suicide; for female residents, malignancies. It has been argued that because these young physicians are so busy caring for others, they are too busy to care for themselves and they do not receive the same degree of health maintenance we prescribe our own patients. This study concluded that providing trainees with a supportive environment, and with medical and mental health services, is integral to reducing preventable deaths and fostering a healthy physician workforce. 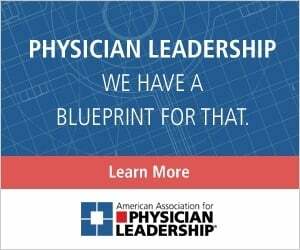 What approaches might we employ to effectively prevent or treat physician burnout? 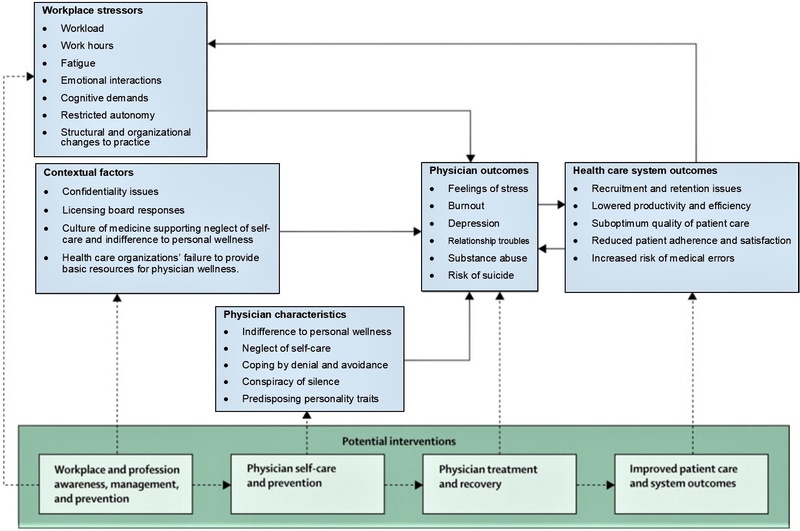 Another way to ask the question is: “How do we get the physician to participate in his or her own mental health maintenance?” The answer might be as simple as creating a twofold process: The first is to use prevention, and the second is to outline a process for treatment. Through ongoing discussion, individuals are more likely to recognize the signs of burnout and stress in themselves and their colleagues. Education about the risks and causes of burnout, as well as an open understanding that it can occur in anyone, is key. By discussing it, we are more apt to treat it. Creating an environment that allows providers to seek help is paramount. In an environment where it’s expected to seek a solution before it’s too late, an accepting and healthy environment can be maintained. Teaching practitioners simple techniques to combat stress and pressure can help resolve everyday stressors. Mindfulness training can be taught in a brief, well-designed classroom environment. Individuals learn the triggers that might set off stress and learn to deal instantly with the situation and solution. Pausing briefly in the work environment to deal with in-the-moment stress can be done easily, but it requires training and a realization that certain triggers are present. Some digital watches and exercise devices can be programmed to detect a rise in pulse and indicate a need to reduce stress. Contemporary research says participation in a mindfulness communication program is associated with both short-term and sustained improvements in the well-being and attitudes associated with patient-centered care.12 By structuring small-group study, physicians can be taught to take time out of their day to learn how to practice mindfulness. Employing techniques of meditation, self-awareness exercises and narratives about meaningful clinical experiences can lead to measurable outcomes. These outcomes can reflect not only improved provider satisfaction, but also can lead to better patient care. Simply said, happier doctors lead to happier patients. Coaching can be elaborate or simple. Much like mindfulness, a simple solution might be programming a watch or exercise tracker to tell the user to take breaks, stand up or breathe when an elevated heart rate is detected. Some coaching systems are more complex.19 Many career coaches are more than willing to take on new clients and counsel providers as they come forward. These coaches may be employed by the system, which can be defined as the employees of a small office, a group of regional medical centers or a geographic area. More elaborate and intense programs exist for providers at risk of career burnout. These multistep, intense programs can dissect triggers and personality traits and provide solutions for improvement. These often require testing, interviews and classroom time to build a better response to situations. Providers must be motivated and dedicated to finding a personal solution. Some providers might prefer confidential help. An ideal alternative for such confidential help is a separate medical society supported by private funds. Medical societies aimed at serving providers can design programs that improve wellness and can cooperate with private or large groups. Several wellness programs are starting to cross system lines for the health and safety of the providers they serve. Fast, confidential and low-cost alternatives for counseling or coaching should be available to providers. Success in these programs must not only be supported by the provider’s employer but also the medical board at the state level. Many medical boards realize the wellness of the providers they serve is paramount to their success. 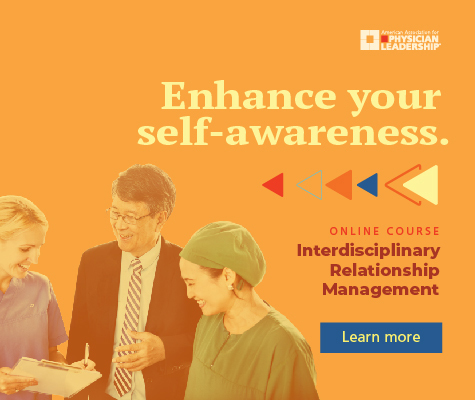 Self-awareness is a key strategy to physician resilience.21 As we learn more about ourselves and how we react to certain stressors in our everyday work environment, we can improve our own overall health. As with the programmable watches mentioned above, we can become more keenly aware of situations or events that distress us and program a response. If we envision each of the aforementioned tools as making up the “wellness toolbox,” we will provide physicians with access to much of what they need for success. Many health care systems have embraced the “Triple Aim” concept — enhancing the patient experience, improving population health and reducing costs. A novel addendum to the Triple Aim for health systems is adding a fourth aim of improving the work life of clinicians and staff — to make work more enjoyable.23 These solutions need not be costly to the system. Partnering with community and local resources can be an inexpensive alternative to the internal costs of providing these programs. For example, partnering with local health clubs for reduced rates for providers can make access to exercise more readily available. Work life improvements might be hard to define, but they’re a goal worth having. My proposal for physician success involves one final addition to the numerous ideas outlined above. With my training as an emergency physician, I am often the first to arrive at a critical situation as a team leader in patient resuscitation. Critical and rapid response to the threatened provider should be no different. Whether organizations recognize burnout in a provider, or a physician has a self-realization they need help, a third group might emerge. This group includes providers who either are not aware they suffer from burnout or they are unwilling to admit they might suffer from it. This group might also increase in size by referral from other parts of the organization. Colleagues who suspect a provider is heading toward burnout can offer to intervene on behalf of their associate. Complaints of exhaustion, depersonalization and a loss of personal accomplishment are all signs of burnout. To many close associates, these complaints may be recognizable as out of place or uncharacteristic of the provider with whom they are familiar. Education about burnout for all providers will make it easier to identify these traits in a teammate and prompt collegial referral. In medicine, black humor serves as a defense mechanism for providers. An increase in such humor might be a sign of impending burnout. Also, providers might become aware of their own burnout only after a patient’s or nurse’s complaint. It might also be brought to light after a bad outcome. Professional practice committees are often made aware of trends in complaints as well as undesirable medical outcomes, and providers who have a spike in complaints, complications or adverse outcomes might, in fact, be heading toward burnout. In emergency medicine and critical care, we are trained to form rapid-response teams to react to patients with the slightest of abnormal vital signs or symptoms. We call for all hands to respond to a potentially devastating illness or event. In a rapid-response situation, all caregivers are called to help the team save a patient. But what if physician complaints or events involving poor outcomes also triggered a rapid response? The response team could be composed of multiple specialty members, and perhaps counselors trained to combat stress. In addition, medical colleagues who have gone through mindfulness training and coaching could respond to the provider. The coach might also serve as a mentor to that provider. Lastly, someone from the human resources team could determine what the system has to offer to aid recovery. It might be difficult to quickly and efficiently determine if a complaint is simply that, or if something greater lies beneath the surface. A rapid-response team for provider wellness has merit. Many hospital and medical organizations have a wellness committee or a provider governance council that can identify these potential providers. Referrals from these committees might be career-saving, but pushback might also be problematic. It is fraught with a potential for resistance. By nature, physicians have been shown to resist the notion of imperfection. The key to success is a change in culture that gives providers the freedom to ask for or seek help. That is easier in a system that embraces physician wellness. By changing the system’s culture, providers will be more willing to accept help. If the providers in the system also are given the tools to be well, and know how to use these tools, the job will be easier. Provider buy-in must be slowly and deliberately introduced to avoid the feeling of forced or obligatory change. Many systems introduce the benefits of emotional or psychological help at the time of hiring or orientation. Just as providers meet with the medical staff office to get their parking permit, ID badge and computer training, incorporating wellness options at the time of orientation makes sense. A 30-minute session at the beginning of a provider’s employment is free from the bias that might be perceived by providers as reactionary. Familiarity with the system of help at the onset of joining an organization lessens the impact of asking for help later. Research also has shown that testing medical personnel before they begin employment can help predict responses to stressful situations.24 This may set up a system and an individual for success rather than failure. To combat provider burnout, a cultural shift must be undertaken by the entire system. It must be aimed at improving the daily lives of providers. By fostering a culture that recognizes the potential of burnout and teaches providers about it, burnout might be avoided. In a culture of acceptance and nurturing, those tuned into recognizing stress in others might even recognize it in themselves and act accordingly — and perhaps seek their own help. In a healthy system, burnout can be avoided. We must be willing to truly understand burnout and physician wellness and combat it with a team approach in a supportive system. Matthew Michael Eschelbach, MS, DO, CPE, FACEP, FAAPL, is the medical director of physician relations and undergraduate medical education of St. Charles Health System in Bend, Oregon. Maslach C ., Jackson SE and Leiter MP. Maslach Burnout Inventory (3rd ed.). Palo Alto, CA: Consulting Psychologists Press, 1996. Daniels AH, DePasse JM, Kamal RN. Orthopaedic surgeon burnout: diagnosis, treatment, and prevention. J Am Acad Orthop Surg. 24(4):213-9, Apr. 2016. doi: 10.5435/JAAOS-D-15-00148. Review. PubMed PMID:26885712. West CP, Dyrbye LN, et al. Single item measures of emotional exhaustion and depersonalization are useful for assessing burnout in medical professionals. Journal of General Internal Medicine. 24(12):1318-21, Dec. 2009. doi:10.1007/s11606-009-1129-z. Shanafelt TD, Boone S, et al. Burnout and satisfaction with work-life balance among US physicians relative to the general US population. Arch Intern Med. 172(18):1377-85, Oct. 8, 2012. PubMed PMID: 22911330. Wallace JE, Lemaire JB, Ghali WA. Physician wellness: a missing quality indicator. Lancet, 374(9702): 1714-21, Nov. 14, 2009. McClafferty H, Brown OW; Section on Integrative Medicine. ; Committee on Practice and Ambulatory Medicine. ; Section on Integrative Medicine. Physician health and wellness. Pediatrics. 134(4):830-5, Oct. 2014. doi:10.1542/peds.2014-2278. PubMed PMID: 25266440. Siedsma M, Emlet L. Physician burnout: can we make a difference together? Crit Care 19:273, July2017. doi: 10.1186/s13054-015-0990-x.PubMedPMID: 26134266; PubMed Central PMCID: PMC4489124. Yaghmour NA, Brigham TP, et al. Causes of death of residents in ACGME-accredited programs 2000 through 2014: implications for the learning environment. Acad Med. 92(7):976-83, July 2017. Accreditation Council for Graduate Medical Education. Timothy Brigham, MDiv, PhD on Physician Well-Being. acgme.org/What-We-Do/Initiatives/Physician-Well-Being/Timothy-Brigham-MDiv-PhD-on-Physician-Well-Being. Undated. Luchterhand C, Rakel D, et al. Creating a culture of mindfulness in medicine. WMJ Jun;114(3):105-9, June 2015. PubMed PMID: 27073828. Kelly JD. Your best life: mindfulness — the end of suffering. Clin Orthop Relat Res. 473(2):426-9, Feb. 2015. doi: 10.1007/s11999-014-4086-8. PubMed PMID: 25571887; PubMed Central PMCID: PMC4294884. Krasner MS, Epstein RM, et al. Association of an educational program in mindful communication with burnout, empathy, and attitudes among primary care physicians. JAMA. 302(12):1284-93, Sept. 23, 2009. doi: 10.1001/jama.2009.1384. Beckman HB, Wendland M, et al. The impact of a program in mindful communication on primary care physicians. Acad Med. 87(6):815-9, June 2012. doi: 10.1097/ACM.0b013e318253d3b2. PubMed PMID: 22534599. Atanes AC, Andreoni S, et al. Mindfulness, perceived stress, and subjective well-being: a correlational study in primary care health professionals. BMC Complement Altern Med. 15:303, Sept. 2, 2015. doi: 10.1186/s12906-015-0823-0. PubMed PMID:26329810; PubMed Central PMCID: PMC4557919. Kotozaki Y, Takeuchi H, et al. Biofeedback-based training for stress management in daily hassles: an intervention study. Brain Behav. 4(4):566-79, July 2014. doi: 10.1002/brb3.241. PubMed PMID: 25161823; PubMed Central PMCID: PMC4128038. Balk JL, Chung SC, et al. Brief relaxation training program for hospital employees. Hosp Top. 87(4):8-13, Fall 2009. doi: 10.1080/00185860903271884. PubMed PMID: 19917546. Fortney L, Luchterhand C, et al. Abbreviated mindfulness intervention for job satisfaction, quality of life and compassion in primary care clinicians: a pilot study. Ann Fam Med; 11(5):412-20, Sept-Oct. 2013. doi: 10.1370/afm.1511. PubMed PMID: 24019272; PubMed Central PMCID: PMC3767709. Gazelle G, Liebschutz JM, Riess H. Physician burnout: coaching a way out. J Gen Intern Med. 30(4):508-13, Apr. 2015. doi: 10.1007/s11606-014-3144-y. Review. PubMed PMID: 25527340; PubMed Central PMCID: PMC4371007. Linzer M, Levine R, et al. 10 bold steps to prevent burnout in general internal medicine. J Gen Intern Med. 29(1):18-20, Jan. 2014. doi: 10.1007/s11606-013-2597-8. PubMed PMID: 24002633;PubMed Central PMCID: PMC3889939. Epstein RM, Krasner MS. Physician resilience: what it means, why it matters and how to promote it. Acad Med. 88(3):301-3, Mar. 2013. doi: 10.1097/ACM.0b013e318280cff0. PubMed PMID: 23442430. Leary MR, Tate EB, et al. Self-compassion and reactions to unpleasant self-relevant events: the implications of treating oneself kindly. Pers Soc Psychol. 92(5):887-904, May 2007. Soc Psychiatry Psychiatr Epidemiol. 47(6):1001-11, June 2012. doi:10.1007/s00127-011-0408-2.